Gliding on a soft and gentle breeze the goddess arrives on her dandelion carriage, propelled by pink lightning. 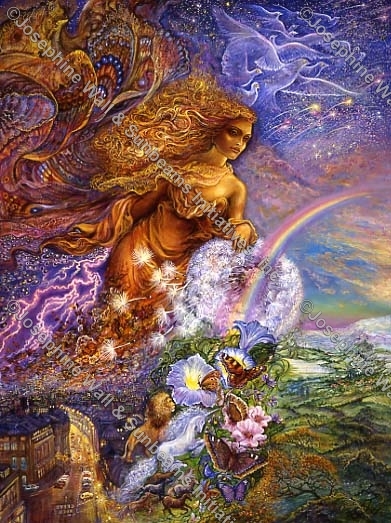 Her presence is heralded by a thousand shooting stars lighting up the air like celestial fireworks, a flock of doves of peace, and the arrival of a rainbow bringing hope to a planet under threat. She recognises the danger of the spreading cities full of concrete and machines, devouring the beautiful and life giving earth. The time for change is now, before it is too late! !